Looking like some old 1950s radio, the Sanyo R227 is being advertised as an Internet Radio, which is odd, as it’s so much more. 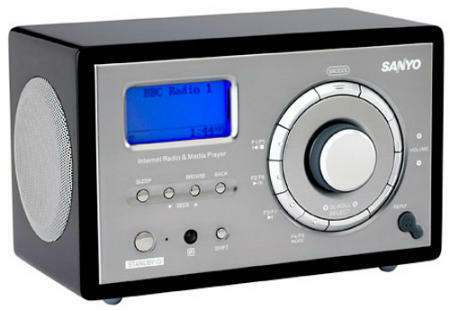 It is an Internet radio, and you can stream your Internet Radio stations through the R227 without a PC, as it supports both Ethernet and Wi-Fi. But you can also stream your tunes from your PC, which is exactly what the Squeezebox was built for. As such, the R227 is just as much a wireless music player as the Squeezebox, even though you’d never know from Sanyo’s own description of the device. But no, it comes with a standard audio-out jack for plugging into any Hi-Fi you can lay your hands on. In fact, when you look at its long list of features, it more than gives the Squeezebox a run for its money. I’ve no idea of its sound quality yet, which is one of the Squeezebox’s real strengths, but given that the R227 is set to sell for just $169.99, it’s over $100 cheaper than the Squeezebox. Really, Sanyo, you should fire your PR agency – the R227 looks like a terrific little box, yet you’d never know from its press release!